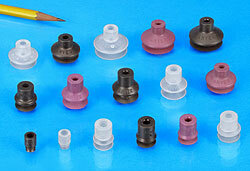 1.5 Bellows Vacuum Suction Cups attach gently and easily with minimum pressure. 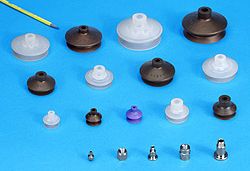 Excellent for most concave and convex shapes, bellows suction cups attach to curvatures such as containers, bottles, cylinders, etc., and can be used in any orientation. Their spring action compensates for height variances in the load or machine inaccuracies. 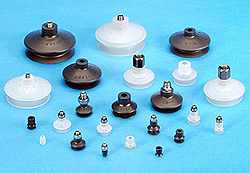 The bellows suction cup design duplicates the function of mechanical springs and ball-joint connectors in a much smaller and more economical package. Note: The name of these vacuum cups and their labeling does not necessarily reflect the diameter that makes contact with the load. 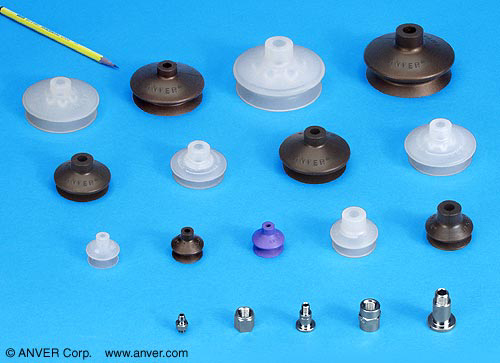 To find the exact diameter, click on the desired vacuum cup below and verify its Flared Overall Diameter specifications. For more information about the materials, click here. 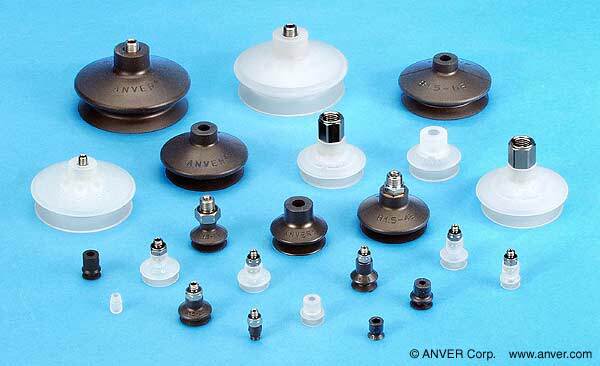 For example: ANVER vacuum cup number F52 has a rated capacity of 15.10 lb at 24″Hg. The pull-off capacity at 27″Hg for this cup would be15.10 x 2 x 1.125 = 33.98 lbs. From this point, it is necessary to calculate the safety factor based on the vacuum level being used, and the altitude.